1. If you practice your Math Vocabulary, you will increase your Math reading comprehension. "Vocabulary is strongly correlated to reading comprehension" (Davis 1968; Fitzgerald and Graves 2005). 2. If you practice Math Vocabulary, your students content learning will increase. "Vocabulary is a predictor of students' comprehension and content area learning" (Espin and Foegen 1996). 3. If you practice Math Vocabulary, your students will act more positively towards learning new Math. "Lack of vocabulary knowledge can negatively affect learning content" (Fisher and Frey 2008). How can you start implementing more vocabulary today? A quick NO PREP solution is to try a WRITE the Room with MATH activity with your students. Practice and engage your students in Math Vocabulary. Students will enjoy reviewing and learning new Math concepts that will help their reading comprehension too. One of the activities that always bring more depth, conceptualizing, and meaning to mathematics is any time spent on Math Vocabulary. It's important to learn and practice using Math Vocabulary in an appropriate way to extend the learning of Math concepts. 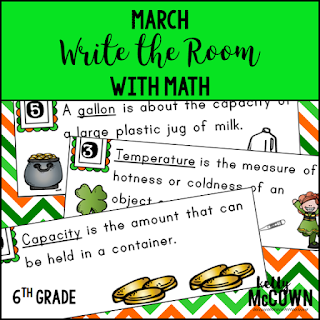 These Write the Room With Math activities for March are a great way to get your students up and moving about the room with vocabulary. 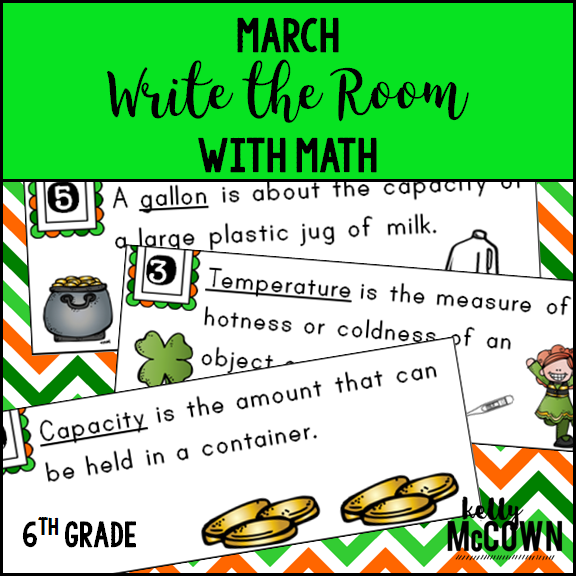 Click HERE to view more of March Write the Room with Math! Keep working with your students vocabulary and your efforts will pay off in the long term! Espin, Christine A., and Anne Foegen. 1996. “Validity of General Outcome Measures for Predicting Secondary Students’ Performance on Content-Area Tasks.” Exceptional Children 62: 497-514. Fisher, Douglas, and Nancy Frey. 2008. Word Wise and Content Rich, Grades7-12: Five Essential Steps to Teaching Academic Vocabulary. Portsmouth, NH:Heinemann. Fitzgerald, Jill, and Michael F. Graves.2005. “Reading Supports for All.”Educational Leadership 62 (4):68-71.